GRAY PHOTOGRAPHY WORKSHOPS COMING TO MI! Award winning Top Endorsed Westcott Pros Zach & Jody Gray have hosted their IN-CAMERA photography workshops in Nashville, Jacksonville Beach, Orange County, and are now coming to Michigan! 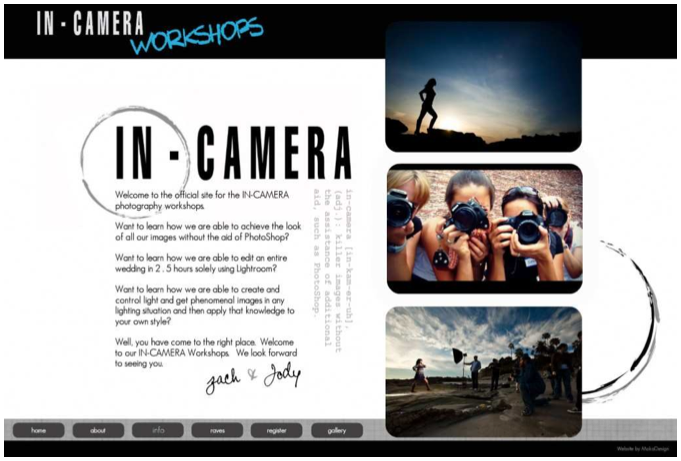 To register, visit the IN-CAMERA Workshop Website. Zach and Jody are incredible photographers, incredible people, and I'm honored to call them friends of mine! They hosted the ONE DAY INTENSIVE for me in Nashville, and I'm THRILLED to be hosting them in our studio in Grand Ledge. In addition to being super talented photographers, Zach and Jody are great teachers. - Want to learn how we are able to achieve the look of all our images without the aid of PhotoShop? - Want to learn how we are able to edit an entire wedding in 2.5 hours solely using Adobe Lightroom? - Want to learn how we are able to create and control light with on- location studio strobes and get phenomenal images in any lighting situation? Our IN-CAMERA series of workshops actually show you how to shoot images that amaze right in the camera. These workshops feature class time, hands-on shooting with professional models, on location studio lighting, post-production and/or image critiques and much more. These workshops are fun, informative, and a great time to hang out with and meet other photographers who want what you want – great images without having to spend hours behind a computer screen editing. Listen to Zach & Jody share the successes and tools they have implemented in their own business which has grown from shooting their first wedding June 2007 for $500, to making a six-figure income just one year later. This all-encompassing workshop dives into the most important areas that Zach and Jody have put into place of running a modern day, cutting edge photography studio that will continue to thrive regardless of the economy. Some of the topics covered: marketing, branding, standing out, pricing yourself to succeed, investing in your clients & vendors to work for you, creating balance, dreaming big dreams, and executing goals. Zach and Jody Gray founded Gray Photography just three short years ago, and have since gained local and national recognition for their work. They have been named by Westcott as one of their Top Endorsed Pros, have had their work featured in PPA magazine, have worked with high profile clients, hosted numerous highly successful photography workshops, have motivated and educated other photographers at various speaking engagements including Pictage’s National Conference last fall. Named as one of Nashville Tennessee’s top wedding photographers, Zach and Jody take pride in the experience and combined talents they are able to offer the client who seeks something different. Zach, an expert in advanced off camera lighting, brings his experience and knowledge on location fashioning an artistic flair, while Jody's expertise with her natural eye, lie in photojournalism. With their combined blended styles, in addition to the relationships Zach and Jody forge with their clients, they offer an experience that few others can give. What’s even more remarkable about this couple is their images never see the inside of Photoshop. All of their work is shot in-camera with minor post processing performed via Adobe Lightroom. They can post-process an average 1,200 image wedding in just 2 1⁄2 hours.Zach and Jody Gray are based out of Nashville, TN and have been married for 4 years. They have a passion for marriage, for helping others in business and they absolutely love what they do!